Bianca Ygarza (Conestoga, Pa./Penn Manor) continues to pick up awards, even after she has played her last basketball game at Eastern Mennonite University. The senior forward today was named to the D3hoops.com All-South Region Third Team, her second time receiving the honor. Ygarza led the Royals to their second consecutive NCAA Tournament bid, leading the balanced team in scoring (14.0 ppg), rebounding (6.2 rpg), and field goal percentage (50.9 FG%). She was second on team with 61 assists and third with 33 steals. The multi-faceted forward ranked in the top 23 in the Old Dominion Athletic Conference in 13 categories, including fourth in points per 40 minutes and free throws. Ygarza scored a season high 28 points in 78-72 loss at Ferrum, which was the South Region’s No. 1 team. She finishes her career with 1,215 career points, good for sixth in program history. Ygarza is also seventh with 671 career rebounds, tied for 13th with 132 steals, and just outside of the top 15 with 179 assists. D3hoops.com also put Ygarza on the All-Region Third Team after her sophomore season. She is a three-time All-ODAC First Team honoree, and was named ODAC Player of the Week twice this season (four times in her career) and Royals Athlete of the Week once. Ygarza was one of four ODAC women honored to all-region teams. Click here to see the entire D3hoops.com women’s All-South Region teams. Eastern Mennonite finished the year with a record of 22-6, their third straight season with 20 or more wins. For the second year in a row, the Royals won the ODAC’s regular season at 15-1 and earned an at-large bid to the NCAA Tournament. They were eliminated by Sweet 16 participant Christopher Newport University. Ygarza is part of a senior class which finishes with the most wins of any class, compiling a record of 80-28 overall and 60-12 in the Old Dominion Athletic Conference. A big season just got a little bigger for EMU men’s basketball player David Falk (Madison, Va./Madison County), as the junior was named to the D3hoops.com All-South Region Third Team. In his first season as a starter, Falk led the nation in rebounding and was also named All-ODAC First Team. Only 15 men from the South Region were named to all-region teams. The 6-6 Falk started all 28 of Eastern Mennonite’s games this year and responded by averaging a double double at 14.1 points and 13.4 rebounds. His 375 total rebounds were 17 better than anyone else in D-III. The athletic big man also swatted 2.93 blocked shots an outing, good for 10th in the nation. He charted 16 double doubles, which was 12th in the country, and shot 59.7% from the floor. Falk broke EMU and ODAC records with 28 rebounds against Lynchburg in the ODAC Tournament. He also broke EMU’s record for rebounds in a season with 375, and tied EMU’s record for blocked shots in a career with 151. He had 82 blocked shots this year, which gives him EMU’s record for blocked shots in a season as well. Falk also had a memorable weekend when he landed in ESPN SportsCenter’s Top 10 Plays for a dunk against Randolph College in a Feb. 15 game. Aside from his All-ODAC First Team award, Falk was also named ODAC Player of the Week once and Royals Athlete of the Week twice this winter. 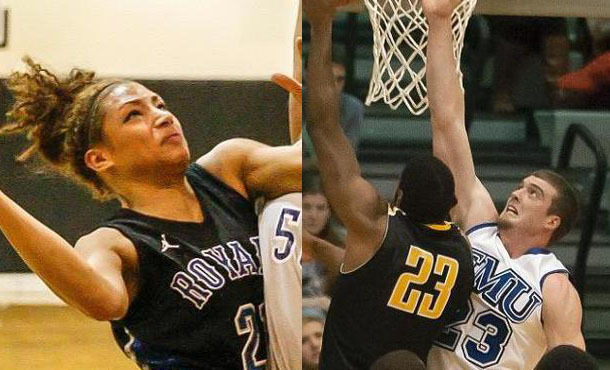 He earned a spot on the all-tournament teams at both weekend tourneys the Runnin’ Royals played at early this season. Falk was one of five ODAC players honored to all-region teams. Virginia Wesleyan senior D.J. Woodmore was named the South Region’s Player of the Year. Click here to see the entire D3hoops.com men’s All-South Region teams. Eastern Mennonite finished the 2013-14 season with a record of 17-11 overall and 10-6 for fifth in the Old Dominion Athletic Conference. Playing with just one senior, the Runnin’ Royals were playing their best ball at the end of the year, building a six-game winning streak before losing to Hampden-Sydney in the ODAC Tournament semifinals.